Click map to download pdf. 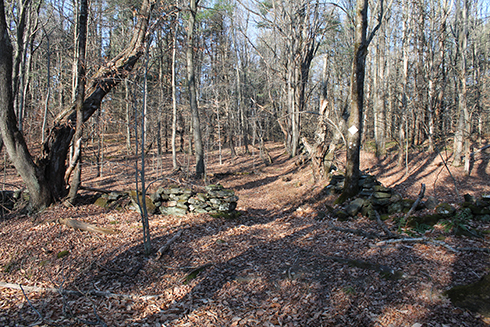 The conserved lands of the Putney Mountain Association (PMA) are part of the Windmill Ridge Nature Reserve, most of which lies along a prominent ridge stretching from Brattleboro to Athens. 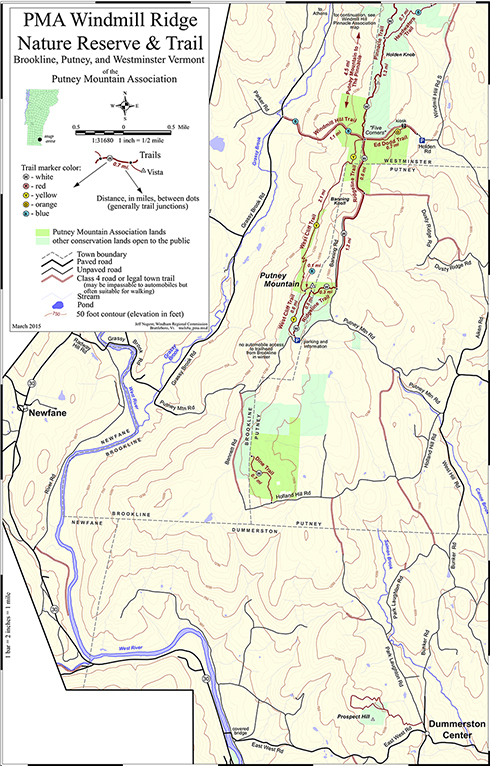 The PMA cooperates with the Windmill Hill Pinnacle Association in managing this reserve; PMA owns about 400 of its acres in Putney, Brookline, and Westminster. These holdings include the cleared outlook (1647’) popularly known as “Putney Mountain”, from which there is a spectacular panoramic view west over the ski areas of Mts. Snow, Stratton, and Bromley to the modern wind farm in Searsburg, some 30 miles away. Mt. Monadnock dominates the eastern view. PMA lands also include an extensive trail system, described below. The ridge is composed of rock which was once ocean bottom, but later was folded and uplifted, compressed, and “cooked”. The small garnets found in the ledges of Putney Mountain were formed in this process and reflect the thermal history of the rock. On the western edge of the ridge, the hemlock-covered slope drops steeply down to the West River Valley. In contrast, the gentle eastern slope, now forested in birch, maple, and oak, is crisscrossed with old stone walls and dotted with cellar holes, remnants of a hardy but long-gone 19th-century hillside settlement. In fact, Windmill Mountain itself is named for the windmill which once stood as part of the settlement near the present Five Corners. Water drains off the ridge in three directions: west to Grassy Brook and the West River, southeast to Canoe Brook, and due east to Sacketts Brook, all of which flow into the Connecticut River. The summit of Putney Mountain is famous for its annual Fall Hawk Watch, a chance to see migrating raptors in the thousands following ridgeline winds and thermals. The ridge offers an important north-south wildlife-movement corridor for medium-sized and large mammals, including deer, bobcat, red and grey fox, fisher, coyote, and possibly moose and/or bear. For decades the summit of Putney Mountain has been a favorite destination for local people and visitors from afar.